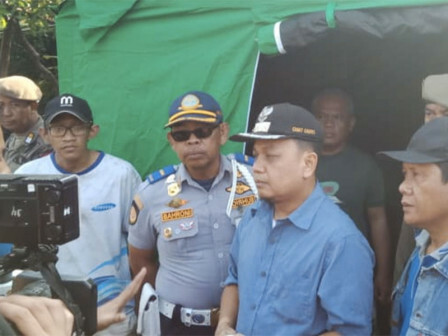 Petamburan Grogol Sub-district Head, Achmad Sajidin takes his time to visit a residential citizen in RT 07/RW 08, Jelambar that was burnt last Saturday (1/5) dawn.
" I see a refugee camp and a public kitchen already set up near the scene since dawn"
Sajidin disclosed that the fire destroyed 40 homes and caused 92 families comprising 368 people have been left homeless. "I see a refugee camp and a public kitchen already set up near the scene since dawn," he expressed. To lighten victims' burden, he has cooperated with related units to distribute logistic aid. "No fatalities and casualties here. It is allegedly due to electricity short-circuit," he explained. West Jakarta Fire and Rescue Sub-Department's Operation Section Head, Rompis Romlih explained that he got fire report at around 11.40 PM yesterday. "32 fire trucks are immediately sent to put out the flames," he told. And finally they managed to control the flames within four hours.